while we make this place more awesome! Starting mid-February 2019, we will be renovating to improve upon our Respite Resort. Our well appointed studio suites offer a private, two-piece ensuite, and features 12-foot loft ceilings, accentuated by luxurious 7-foot floor-to-ceiling windows. 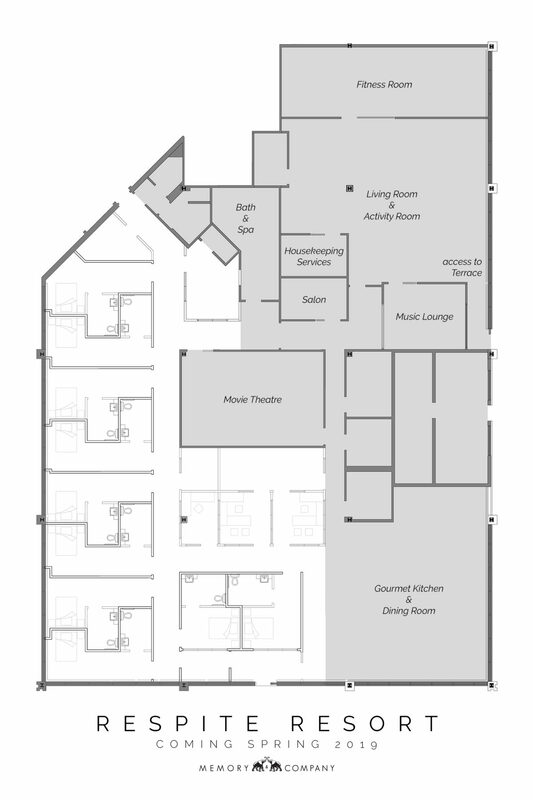 The 10 suites, ranging from 175 square feet to 240 square feet, will be beautifully furnished in contemporary design, with elements specifically for ease-of-use for those living with memory loss, and amenities to ensure a restful night such as an intercom for room-service or assistance, and movement sensors. Have questions or want to book? Access to our internationally-known, Premium Day Program every day of your stay, starting on the day you arrive. Full activity program including cognitive and physical fitness, socialization, music, pet and art therapies, and personalized programming. Beautiful, private bedroom, decorated in a home-like style. 24-hour supervision and monitoring by experienced Support Team Members in a secure Club. Three nutritious meals per day, prepared on-site by our Executive Chef, two scheduled snacks, plus access to snacks and drinks throughout the day. Medication management and nursing overseen by a licenced RPN from 7 a.m. to 11 p.m. Doctor on-call 24 hours a day. Daily housekeeping and bed-making services. One assisted bath included every third night of consecutive stay. Stay for the Day Program on the day of check-out, and extend check-out time as late as 10 p.m. for an additional fee. Remember, Day Program is already included for each day of stay. Get pampered with services including hair care, manicure/pedicure, and massages to name a few. Ask us for available services. Additional bathing assistance can be added to your stay for an additional fee. Remember, bathing assistance is already included every third night of consecutive stay. Bath & showers are available anytime for those who do not require assistance. Laundry service is already included every three nights of consecutive stay. Additional laundry service can be added to your stay for an additional fee. We can take care of stocking premium incontinence products for an additional fee. Remember, laundry and bathing assistance is already included in case of an incontinence mishap. Access to our internationally-known, Premium Day Program every day of your stay, starting on check-in day. 24-hour supervision and monitoring by experienced Support Team Members in a secured Club. Assistance with activities of daily living such as toileting and personal care. $100 – Stay for the Day Program on the day of check-out, and extend check-out time to 6 p.m.
$35 – Additional bathing assistance can be added to your stay. Laundry service is already included every seven nights of consecutive stay. Additional laundry service can be added to your stay. $9/day – We can take care of stocking premium incontinence products. Overnight respite has never been easier. Members benefit from lower minimum stays. Overnight respite includes Day Program on day of check-in. Day Program can be added for check-out day as well. Anyone who has not stayed within three months of their last visit, or has had a significant change in their health requires an assessment prior to their stay. The assessment is free of charge.